Korea has a long and rich history. It was a unified nation for 1300 years. At a time when Europe was declining into the contentious "Dark Ages" of the Medieval period after the fall of the Roman Empire, Korea was creating new art, architecture, literature, science, and religion, and developing a strong central government that allowed for long periods of peace and prosperity. The Choson dynasty of Korea, which lasted over 500 years, is one of the world's longest lasting and most stable royal lines. 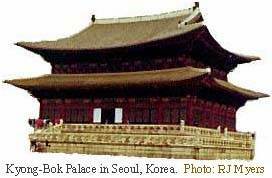 Their palace, Kyong-Bok (shown above), was built in 1394 at Seoul. Korea's past has a strong influence on its present. Physical reminders of the past are found everywhere mixed with the structures of today. 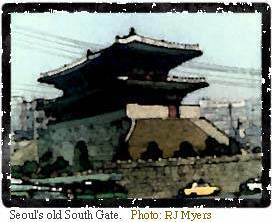 The South Gate (NamdaeMun, built 1396 AD) of the ancient wall around the old city of Seoul shown below is surrounded by modern buildings, power lines, and autos. A proper understanding of Korea today rests on at least a brief look at its history. So use the menu bar at the left to see how Korea has changed through the ages.